Looking for some cute animal diaper cake ideas? 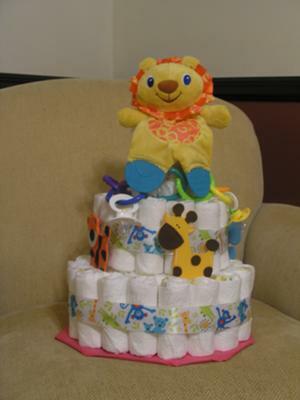 Checkout Pam's adorable Animal diaper cake below and you'll find some cute ideas for a precious little cake! The animals that Pam uses give it just the right amount of 'baby' feel to it. And the ribbon brings in some great color. Very cute! Pam, thanks for sharing your darling diaper cake with the rest of us!! And thanks for your helpful tips & advice as well! I used Pampers diapers and rolled them straight out of the bag (didn't unfold first) with colored rubberbands. I found cute jungle animal ribbon and used glue dots (like for scrapbooking) to secure the ribbon. It helped to attach one end of the ribbon first and then pull it tight around the cake and attach the other end. I also found some cute painted wooden animals to decorate the bottom layer, and then used baby rings to dangle the pacifiers around the cake. The mother-to-be had asked for a stuffed animal on her registry, so I added that on the top. Fun and relatively easy to make AND the mom-to-be loved it! I just loved your post! You have inspired many on creating such wonderful animal cakes for friends and family who will be simply amazed by such cute cakes! Thanks! I am appreciating the efforts you have made to write such a great post. It is super helpful to look at when i make my own diaper cake. very interested in making one like yours, how many diapers did you use?